«The "OT levels" are factually the most expensive form of exorcism known to man.» — Jon Atack, "Hubbard and the Occult"
«I suppose the guy who has trouble running another Thetan at that proximity probably not very horse-powered or something of the sort. Well all I ever did was a body Thetan was just think "go to the .. uh .. uh .. think Incident One zoooom! Go through it, get your stop off you know", "Rmmm", he says "Rmmmm. Zooooom! Hrrm. Hey that's mine!" he'd say. "I'm leaving!" I'd say "Good bye!" [laughter]» — L. Ron Hubbard, "Assists lecture", 3 October 1968. Beware: this is a core belief of Scientology, even though the Scientologists who are aware of this high level belief will flatly deny about it. Only Scientologists who attest OT3 and higher know about this. Most levels above OT3 are about "exorcizing" these alien spirits through Scientology's expensive "auditing". Body thetans are the last obstacle that prevents a high level scientologist from being able to move or act in the physical universe without the use of a body. To date, there is no known past or current scientologist who has exorcized all of his body thetans, hence the absence of any scientologist able to demonstrate their purported extraordinary abilities. Don't hold your breath. More troubling, there are evidences that high-level Scientologists are also told that these pesky body thetans are responsible for whatever illnesses they may have (epilepsy, cancer, etc. ), and are told that if they successfully exorcize them, it will cure these illnesses. "I have sought," Lowry [the main character] argues, "to show that demons and devils were invented to allow some cunning member of the tribe to gain control of his fellows by the process of inventing something for them to fear and then offering to act as interpreter"
So it appears that the idea of controlling people by inventing "demons and devils" (replace with "body thetans") for them to fear had already crossed Hubbard's mind in 1951. And it is quite telling of his character that he (rightfully) qualified this as "cunning," and would later promote the same control mechanism in Scientology by instilling his followers with fear of "engrams," "body thetans," for which he had (expensive) "solutions." To my great dismay, I discovered that the rest of the Bridge to Total Freedom was all about BTs, BTs, and more BTs. Roland Rashleigh-Berry (Nov. 1998): "Horrible Truths for Scientologists"
Scientologists have heard about "Thetans", "theta" as well as "theta bodies" perhaps, but they won't have heard the term "Body Thetans", nor will they be able to find it in their Tech dictionaries. This is because the information is being withheld from them until they reach a secret level in Scientology known as "OT III". On this level, they are told that they are full of the Thetans (or souls) of murdered space-aliens. Roughly 2,500 of them. And they have to talk to them telepathically to make them go away. Tilman Hausherr (1998): "NOTS34: criminality successfully protected by copyright law"
Scary: L. Ron Hubbard considers *all* illnesses to be the result of body thetans. But himself he didn't mind to be put on "Vistaril" or other drugs. L. Ron Hubbard was obviously afraid to eat his own spiritual sausage, like the Phillipino "psychic surgeons" who sent their families to real hospitals. 38. What do I read in the OT IV materials? That I now have to handle "Body Thetan Clusters. I said what? More BTs? I was told yes, now I am handling drugs on the "whole track": all drugs I ever did and the drugs the body thetans did. These body thetans, you see, were not gone after OT III because they were "druggies." Ok, I said. Let's get rid of the druggie body thetans. «74. The OT VIII material was titled "Truth Revealed." When I opened the materials and read the data, I went nuts. I couldn't believe what I was reading. BODY THETANS! So with that in mind, suddenly I realized why I had this horrible thing called Epilepsy! It wasn't just some physical condition as the doctors had tried to tell me early on. It was due to theses things called Body Thetans or Clusters (groups of Body Thetans or 'BT's who were stuck to me). This was an amazing revelation for me and excited me greatly. Jesse Prince (2000): "The Ever Changing Tech of Scientology"
This change had a profound effect on Scientology income, because all of the earlier "failed" OTs now had something else to spend their money on, and they did in droves. OT levels 1-3 stayed the same, but OT levels 4-7 changed completely. The new OT levels 4-7 dealt exclusively with getting rid of comatose BTs. Come to find out, these BTs made up what most people perceive as the physical universe around us. All BTs had to be gotten rid of before any OT could stabilize and realize their true abilities. This new discovery by Hubbard explained all earlier failures in making OT's! Jon Atack (1998): "Hubbard and the Occult"
It is often the case with Hubbard's work that he has simply taken other ideas and dressed them up in new expressions. Careful study shows that Dianetics included such words as "operator", "reverie", and "regression" common to hypnotic practitioners at the time. On leaving Scientology, most people cannot see that the "body thetans" of Operating Thetan levels three to seven are in fact the demons of Christian belief. The "OT levels" are factually the most expensive form of exorcism known to man. Unfortunately, such beliefs and practices can have a severe effect upon practitioners, who take Hubbard's warning to heart and come to believe themselves multiple personalities. I have been called to help in several times in such instances. 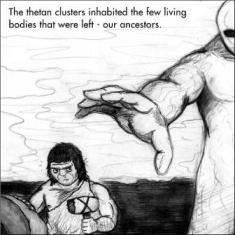 Body Thetans are addressed in Scientology counseling level OT III (Operating Thetan level 3), as part of Hubbard's ongoing series of Space Opera revelations about ancient alien entities and civilizations, such as Xenu and Helatrobus. Upon reaching this level, the Scientologist is told that many Body Thetans are the disembodied souls of the billions of space aliens brought to Earth and blown up by nuclear bombs in volcanos by an evil alien called Xenu, who is said to lead the Galactic Confederacy. Operation Clambake: "OT III Course, summary and comments"
So what the Scientologist needs to do, is audit all these body thetans, that is: lead them through Incident II, and perhaps [Incident] I. Then they'll be off. Every body thetan has to be processed individually. I couldn't find a reference as to their numbers. There might be hundreds; could be more, could be less. If you find none, Hubbard says, one needs to go back to some basic courses and perhaps file for a 'Review', that is, a serious talk with one's supervisor, because finding no body thetans is out of the question. "Truth Revealed" is not on OT VIII, where you only find out that you have to Method 9 Word Clear the book "History of Man" and keep auditing those imaginary BTs and Clusters that never existed anywhere other than in LRH's schizophrenic mind. Plus you find out all your past lives were just imagined, too. Ariane Jackson (1996): "OT8 denounces Scientology"
The so-called "confidential" levels. From OT3 to OT7 all you "handle" is BT's [Body thetans]. OT4 is the effects of drugs on them, OT5 is NOTs, OT6 is just a course to train you in more exotic ways of "finding" and "handling" them, and OT7 is application of OT6. Hermann Philipps: "Scientology: Teachings and Practices"
In OT III, one deals with those body thetans by locating them using the E-meter. If you have difficulties with your, say, right eye, although being a Clear, it may well be that a body thetan or even a whole cluster of body thetans is sitting there with a post-hypnotic command of "I cannot see well" in action. Once found, it is established if it is a cluster of a single body thetan. This determines the procedure to be followed next. The objective is to give those body thetans an awareness that they are thetans who could very well lead their own lives and not to be stuck to somebody else. They will then fly off trying to find some fresh body of their own (delivery rooms in hospitals being favourite places for this). In the case of a cluster, one does this, for example, by running an even earlier ghastly incident which contains blinding light, a steady beat, fanfares being blown and an angel-type being riding to and fro in a carriage. ABC News (1992): Excerpts of "A conversation with David Miscavige"
Forrest Sawyer: "... today their troubled spirits are attached to human bodies by the thousands. Called 'body thetans', they cause endless problems. Only Scientology knows how to shake them loose." Roxanne Friend: "You talk to them, and when you find out who they are and what they are, what they're doing and what's making them stick around you, then they blow. And so you pay a lot of money- I mean, you have lots of body thetans, so this process takes lots of time. ..."
Margery Wakefield (December 1996): "Testimony"
I was assigned a room in the hotel, and taken through all the preliminary interviews before I could begin my "NOTS" (New Era Dianetics for OTs) auditing. Finally, I was assigned an auditor named Jill, and we began the first session. To my dismay, I was told we were going to be auditing more entities, called "body thetans" in Scientology. Hubbard had "discovered" that there was a category of body thetans, or entities, which did not respond to OT3 auditing, and needed further auditing to get rid of them. The sessions did not go well at all. I just couldn't seem to make any progress. I began to be alarmed as the auditing hours passed by, at a cost of approximately $800 per hour, and we weren't making any progress. 167. Over the next few weeks Flo called me and I called her many times. We spoke frequently, sometimes for hours. On occasion Flo begged me to get rid of the suppressive BTs that were killing her; at others she refused auditing because, as she said, "That's what messed me up in the first place." I spent a lot of time listening to her and letting her talk - she had a lot of fears and hurts. She cried a lot on the phone. She was in constant pain, unable to eat or sleep, and wanted to die or kill herself. She was very scared of the "things" she was seeing and hearing. She often talked about the suppressive BTs, that they were torturing her and making her go crazy, that they were implanting bad things into her and that she had to make them stop or go away. 127. The purpose of auditing at the OT III level, such as Tom Cruise has received, is to contact and audit the BTs and clusters so that the BTs and clusters leave the body of the auditor. The purpose of this is to free the person from the determinism of the BTs and clusters. However, the BTs and clusters that are released by the solo auditor are now back at the beginning of their implant which they received 75 million years ago. Survival then retriggers the basic implant which then picks up a body, or attaches to one that is already occupied, and re begins the whole cycle. 2. I have been told that I am asking the court to determine the validity of Scientology as a religion or the truth or falsity of Scientology's religious concepts. If the above is true, this would include the court's having to determine the validity of Scientology's teaching that human beings are impaired by things called "body thetans" and "clusters" of body thetans that are stuck together on human bodies through no volition of their own. Accordingly, Scientology teaches that these must be gotten rid of, exorcised if you will, through Scientology auditing/counseling called the "Upper Levels." Scientology also states that planet earth, millions or billions of years ago, was originally populated by beings transported here by Xenu of the Galactic Federation. These beings were tortured, frozen, clumped together and electronically forced to reside in various volcanoes. In early 1968 "OT 3" was released. OT 3 is a secret upper level counseling procedure that says thousands of souls of people who died 75 million years ago are attached to your body. I was eligible to start on it shortly after its release. I remember my amazement when I first read the materials and the story of OT 3. I thought it was a joke, or a figment of Hubbard's sci-fi imagination. However, I dutifully made myself read and reread and restudy the story and tried my hardest to counsel myself on the level honestly. (All adverse reactions to the counseling materials are thoroughly explained in Scientology — Hubbard states that those unable to audit the materials have drugs problems, have earlier auditing actions left incomplete, are connected to a suppressive person, have undisclosed misdeeds or a host of other ills). I finally completed the level later that year. Thus, thousands of souls from people who had been dead about 75 million years had been freed from my body to go, each one separately, incarnate and live his or her own life. A downtown Clearwater businessman who last year joined the Church of Scientology was committed to a Mental hospital Monday after a psychiatrist testified that Scientology apparently contributed to the man's insanity. Francis G. Diamond, 45, a successful antique dealer before his breakdown, told Circuit Judge William Walker that other Scientologists' "thetans," or spirits, had invaded his body during counseling sessions and now control him.